Lafe Coleman fires a pitch for the Washington C.H. 10-year-old all-stars during a District Eight tournament game against Huber Heights Wednesday, July 12, 2017 at the Little League complex on Lewis Street. The Washington C.H. 10-year-old all-star Little League team hosted the team from Huber Heights for a District Eight tournament game Wednesday evening. Washington C.H. won the game, 23-1 in four innings. Three Washington pitchers combined for a no-hitter. Lafe Coleman started and pitched two innings. He walked three and struck out five with one run allowed. Xavier Lawhorn pitched one inning with one walk and two strikeouts. Bryson Heath pitched one inning with two walks and three strikeouts. Washington had a massive first inning, sending 21 batters to the plate, scoring 18 runs. The local all-stars tacked on one run in the second and four in the third. Huber Heights scored one run in the second inning. Washington had 14 hits, including six triples and two doubles. Offensively for Washington, Bryson Heath was 1 for 2 with a walk, two stolen bases, three runs scored and one RBI; Trey Robinette went 2 for 3 with a triple and a double, two RBI and two runs scored; Lafe Coleman was 3 for 3 with two triples, one double, two RBI and three runs scored; Landan St.Clair was 0 for 1 with two walks, one RBI and two runs scored. Jakob Hoosier went 1 for 4 with two RBI and two runs scored; Connor Guthrie went 1 for 2 with one run scored; Noah Haithcock was 1 for 1 with two runs scored; Jake Bashor was 0 for 1; Aden Osborne walked and scored one run and Frank Maddux was 0 for 1. Heath drew a walk to begin the bottom of the first inning. He scored on a triple by Robinette, who scored on an error on the play for what turned out to be the game’s winning run. Coleman tripled and scored on a wild pitch. St.Clair walked and Coffman singled. An error on the play allowed St.Clair to score to make it 4-0. Moore hit a triple to score Coffman. Moore soon scored on a wild pitch to put the score at 6-0. Lawhorn was hit by a pitch and stole second. Hoosier reached base after the catcher did not field the third strike. A passed ball scored Lawhorn and Guthrie reached safely after a dropped third strike. After Hoosier scored to make it 8-0, Heath singled in pinch-runner Haithcock to give Washington a 9-0 lead. Heath made it to third and scored on a wild pitch/passed ball and Robinette hit a double. Coleman followed with a double that gave Washington an 11-0 lead. Coleman soon scored on a passed ball and St.Clair walked. Coffman singled, scoring St.Clair and Lawhorn drew a walk. Hoosier singled, scoring Coffman and Moore to make it 15-0. Guthrie singled and Coleman hit a triple scoring Osborne, Hoosier and Guthrie to make it 18-0. For Huber Heights in the top of the second, Dylan Day was hit by a pitch after the first two batters struck out. Caden Tousley walked and Day went to third on a wild pitch. Huber Heights executed a double steal, with Tousley taking second and Day scoring what would prove to be the visitor’s only run of the evening. In the second, Coffman walked and Moore hit a double to make it 19-1. Huber Heights turned a double play to end the inning. In the bottom of the third, Haithcock led off with a single and Heath was safe on a fielder’s choice. Haithcock scored on a ground out by Robinette and Coleman hit a triple that scored Heath. St.Clair had a somewhat rare RBI on an infield pop out that drove in Coleman to give Washington a 22-1 lead. Coffman singled to right and Moore hit a triple to make it 23-1. The Washington C.H. 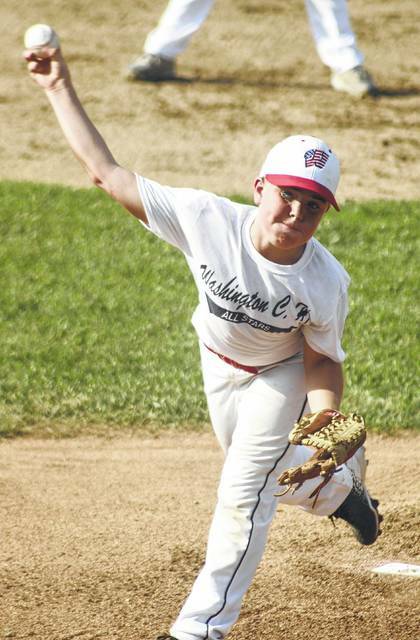 10-year-old all-stars’ next game is Saturday at 1 p.m. at Englewood in the District Eight semifinals against an opponent still to be determined. The District Eight championship game is slated for Sunday at 2 p.m. at Englewood.